This Custom Pewter Ceremonial Key was Made in Rhode Island and cast from reclaimed pewter. The Key to the City or Freedom to the City ceremonies is generally bestowed upon honored guests, visiting dignitaries, or persons of distinction. The observance and ritual of presenting Ceremonial Keys may be traced back to medieval history, when cities were fortified by stone ramparts and locked gates. 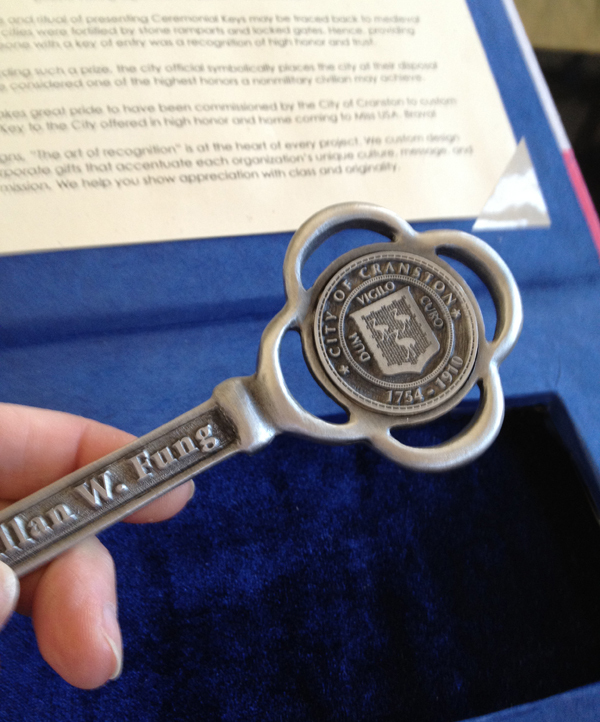 Hence, providing someone with a key of entry was recognition of high honor and trust. Today, by awarding such a prize, the city official symbolically places the city at their disposal and may be considered one of the highest honors a nonmilitary civilian may achieve. Ahlers Designs takes great pride to have been commissioned by the City of Cranston to custom design this Key to the City offered in high honor and home coming to Miss USA. Brava!